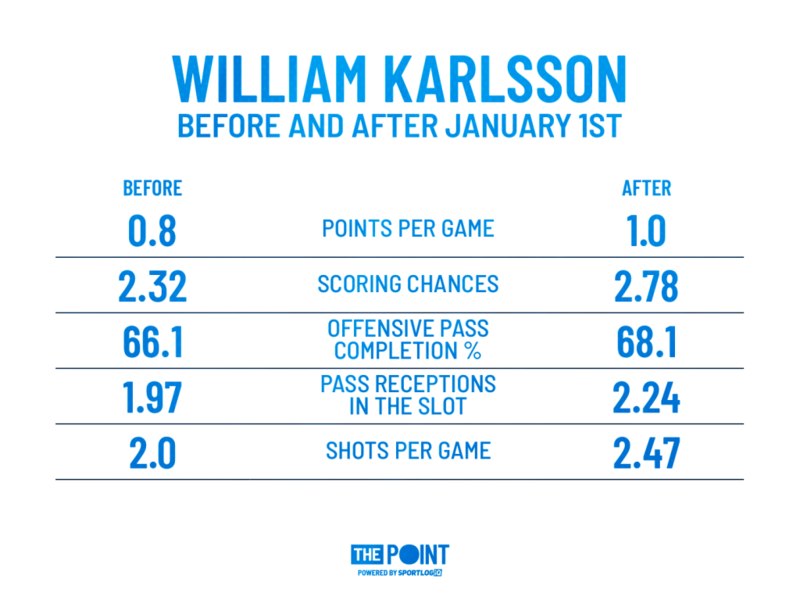 Why a 30+ goal season is in the cards for William Karlsson - The Point Data-driven hockey storytelling that gets right to the point. At this point, everybody knows William Karlsson’s story. 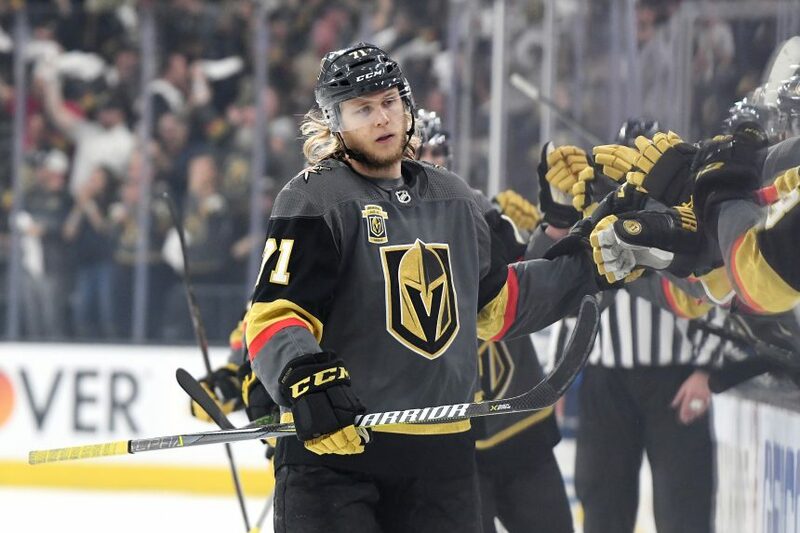 After spending two seasons in a bottom six role in Columbus, he was selected by the Vegas Golden Knights in the Expansion Draft and ran with the opportunity. The young Swede shattered his previous career-highs of nine goals and 25 points with a 43-goal, 78 point campaign playing on Vegas’ top line. There are, however, valid questions as to whether he can be a top scorer once again this season. His shooting percentage did stick out like a sore thumb, clocking in at a whopping 23.4%, nearly a goal every four shots on net. That number is the highest single-season efficiency of any 40-goal scorer since the turn of the millennium. In fact, only two other players have reached the 40-goal plateau on at least 20% shooting since 2000: Milan Hejduk in 2002-03 and Brad Boyes in 2007-08. Nobody has ever accomplished it twice. To put his into context, Steven Stamkos is currently the active leader for career shooting percentage at “only” 16.7%, so the odds of Karlsson reaching this level again are extremely low. Despite an almost assured regression, two things work in Karlsson’s favor. First, most of his goals came on high-danger, high-percentage plays. Of his 43 goals, 36 came via either a one-timer, odd-man rush, breakaway, deflection, or rebound. He also scored a pair of empty-netters, which leaves only five of his goals coming via other plays. In his second year in Vegas, Karlsson should be flanked once again by Reilly Smith and Jonathan Marchessault. They were Vegas’ most used line last season and should be the top line once again. This means those high danger chances should come along once again, if not more often since the chemistry they built over the course of last season will be present from day one. Second, he will likely receive more opportunities than he did a year ago. Last season, Karlsson did not start off the year as the offense’s focal point. He was bounced around the lineup in October, playing some time with Smith and Marchessault, but also receiving regular ice time with Brendan Leipsic, Erik Haula and others. He was still, at the time, “just another guy” that came to Vegas via the Expansion Draft process. His role expanded as the season wore on and his torrid scoring pace left head coach Gerard Gallant no choice but to ride the hot hand. Starting in November, Gallant played him almost exclusively with Smith and Marchessault. In fact, that line saw nearly 700 minutes of ice time together. No other line combination that included Karlsson crossed the 100-minute mark. As he settled in with his regular linemates, Karlsson’s performance kept improving. We can see a big jump when looking at his numbers before and after the New Year. Karlsson’s numbers were up pretty much across the board. Over the first half of the season, Wild Bill averaged 2.0 shots on net per game. That number grew to 2.47 after January 1st. If we assume he keeps up the pace of that second half, which is likely since he will start the season atop of the depth chart for the first time in his career, we can safely project that he should have around 200 shots, an increase over his 184 shots last season. 200 shots would have ranked 86th in the NHL, so it is very much within his reach and he could easily soar past that, but we’ll use that hypothetical total as a safe estimate to use in projections. Projecting volume is the easy part, now we have to project efficiency. 41 of Karlsson’s 43 goals came from the slot, with the remaining two coming from just outside that area, so we’ll focus on that part of his game. To make an educated estimation of efficiency, I created a pool of players who finished within 10 slot shot attempts or slot shots on net of Karlsson’s totals. 59 players matched one or both of those criteria, ranging from elite shooters like Patrick Laine and Nikita Kucherov to rookies like Alex Tuch and Alex DeBrincat. Those players averaged a shooting percentage of 12.6% and all but four of them scored at least 20 goals. If William Karlsson regresses all the way to that average, he would post a 25-goal season, a big step down from his 43, but still a very respectable total. However, with the rate that Karlsson generates high-danger opportunities as mentioned earlier, it seems very likely he can still score at an above-average rate. If we instead compare to some of the top scorers in his shot profile, such as Kyle Connor (16.1%), Jamie Benn (14.9%), and Evgeni Dadonov (14.9%) and project Karlsson to score on 15% of his shots, he would reach the 30-goal plateau. That 15% average would rank just outside the top 50 in the league last season, so it’s definitely an achievable number. Coincidentally, this number is nearly identical to the average shooting of the top 15 goal scoring centers last season (excluding himself), who combined for 15.6% shooting. And keep in mind that those projections are made off a very conservative estimate of a 200-shot season. So, a high shooting IQ, increasing volume, and day one chemistry with his linemates William Karlsson should still be able to put together a 30-35-goal season, despite facing some virtually unavoidable regression.